The Chicago Blackhawks have captured the 2013 Stanley Cup following a thrilling 3-2 victory in Game Six over the Boston Bruins. The Blackhawks went into the unfriendly atmosphere of the TD Garden in Boston and came away with the win, claiming the series four games to two. With the Bruins leading 2-1 late in the 3rd period, the series seemed destined to head back to Chicago for a Game Seven showdown. As the clock ticked down, the Blackhawks turned up the pressure and it paid off as they tied the game on a Bryan Bickell goal with just over a minute to play. With the building still reeling from the tying goal, the Blackhawks were immediately back on the attack. David Bolland found a rebound off a Johnny Oduya shot from the point and, with less than a minute to play, he deposited the puck into the back of the net, giving the Blackhawks a lead they would not relinquish. Patrick Kane, who was a key contributor for the Blackhawks throughout the post-season run, was named the Conn Smythe Trophy winner as the MVP of the 2013 playoffs. The championship is the 5th title in Blackhawks franchise history and their second Cup in the past four seasons, as the club was crowned champions in 2010, breaking a 49-year drought. 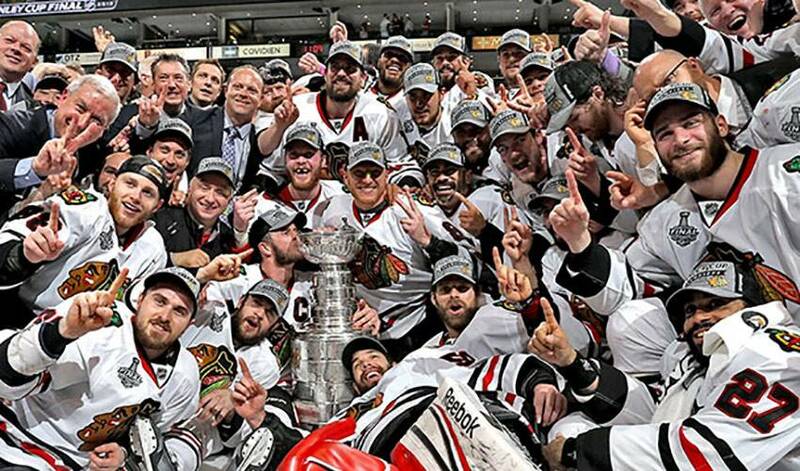 Congratulations to the 2013 Stanley Cup Champion, Chicago Blackhawks!